Greg Gaines has not a care in the world, until his mother told him about his some very terrible news. Rachel was diagnosed with a rare form of leukemia, Chronic lymphocytic leukemia. (Which is where the cancer starts in the bone then it quickly moves into the bloodstream.) Greg Gains becomes her best friend throughout her last couple weeks. Bender high student, Greg Gaines is a student that likes to keep his business to himself most of the time. Earl is a small angry child who grew up with an angry step father. Rachel is a annoying girl, with large frizzy hair. Greg’s mother gives him the news that Rachel has leukemia . At first he does not really care. But then, when his mother forces him to hang out with her, he gets closer and closer to her. Greg is a filmmaker and his bestfriend Earl is the star of all of the films. They recreate their favorite films. Greg and Rachel become very close. Every day after school Greg would go over to rachel’s house and they would talk for hours. Sometimes times they would go to Greg’s house and talk there. Rachel and Greg grow a strong bond, when Greg starts ditching school to moan over her death. This book has some mature parts so it would be great for a 13 year or older. Every page just pulled me in deeper and, there was almost a love story between Greg and rachel. 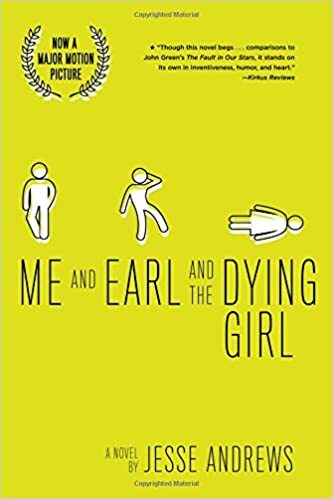 Me, Earl, and the dying girl is a novel that is would be a comedy drama book. There were some very sad parts in the book, But some parts of the the book are very funny. Find out yourself what happens between Greg, Earl and Rachel, the dying girl.